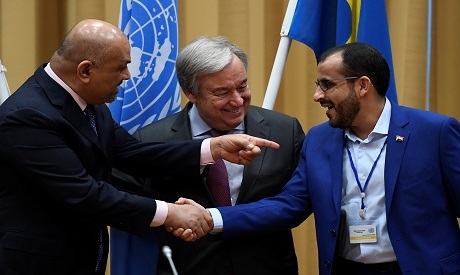 UN chief Antonio Guterres announced Thursday a series of breakthroughs in talks with rivals in the Yemen conflict, including a ceasefire for a vital port. The conflict has triggered what the UN calls the world's worst humanitarian crisis, with 14 million Yemenis now at the brink of mass starvation. Guterres, who flew in to Sweden late Wednesday, announced that the Yemeni government and Houthi rebels had agreed on a ceasefire in the port of Hodeida, the main entry point for imported food and aid. Guterres flew into Sweden late Wednesday to attend the closing session, which had been pushed back two hours from its announced time on Thursday. Britain's Jeremy Hunt notably met with both the government and rebels at the talks. The final vote is expected to take place on Thursday. However, if the upper house approves the resolution, it is likely to run aground in the lower House of Representatives where Republicans hold the majority until January 3. Both the rebels and government alliance stand accused of failing to protect civilians.